In his new sculpture and works on paper, Kevin Appel breaches new territory in exploring the tenuous relationship between the modes of photography, painting, and architecture and the incongruities that are produced at their collision. As in earlier projects, Appel builds his compositions upon a narrative stream of constructing and dissolving architecture. Building on top of his photographs of the Salton Sea, Appel creates a complicated space of utopian collapse. The photographs function as the basis of each composition – large scale images are printed with UV ink on watercolor paper. Acrylic, oil and enamel paints are then layered in complementary ways, creating a complex correlation between the painted and the printed surfaces. Evoking a sense of ordered chaos, the reclaimed landscapes featured in the photographs break down into the essential patterns, tones, and textures of painting. Appel’s sculpture, a 7’ x 10’ x 1’ screen of powder coated steel and brass, recreates the affect of the works on paper in its transparency and use of pattern through which the surrounding environment can be viewed. Appel’s work is an investigation into the connections between different visual strategies and the story of collapse that forms at their intersection. The works in this exhibition pursue a trajectory of reassembly of architectural forms, where expanses of monochrome paint and intricate fields of textured abstraction push and pull against each other to shape a bittersweet optimism. Kevin Appel received his BFA from Parsons School of Design in New York and his MFA from UCLA. He is a professor of studio art at the Claire Trevor School of the Arts at University of California, Irvine. 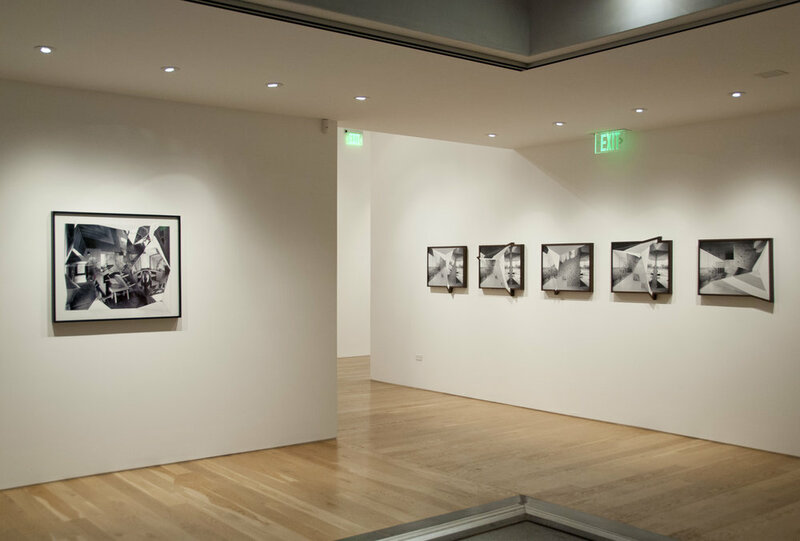 Solo exhibitions include Suzanne Vielmetter Los Angeles Projects; the Museum of Contemporary Art, Los Angeles; Museo Rufino Tamayo, Mexico City; ACME Gallery, Los Angeles; Angles Gallery, Santa Monica; Two Rooms Gallery, Auckland; Wilkinson Gallery, London; and Marianne Boesky Gallery, New York. The latest work of Cannon Hudson continues his investigation into the dichotomy between representational and abstract imagery. References to architectural structures and systems often act as a starting point for a dissolutionary process, where the illusory and amorphous nature of paint acts as a medium of transformation. Hudson questions traditional associations within the constructed world by referencing its margins, the space between, and the incidental: a brick wall or tiled floor, shadows cast by a window frame, a spider’s web, or the structural grid. With their priorities rearranged or their roles re-contextualized, familiar boundaries are transcended at the interface of line, shape, form, nuance and tone. While Hudson’s paintings initially proximate the familiar, visual disruptions and interventions transmute into inexplicable events, generating layered interpretations for the viewer. In Hudson’s re-contextualized arena, indeterminacy becomes a positive visual field for the play between the material and the ephemeral, between the reasonable and the anomalous. Based in Los Angeles and Joshua Tree, CA, Hudson has exhibited nationally and internationally. His work has been shown at the New Museum, NY; MoMA PS1, NY; Galleria d’Art Moderna, IT; White Columns, NY; and the Henry Art Gallery, Seattle, WA. He attended the California Institute of the Arts, and was a recipient of the John Simon Guggenheim Fellowship in 2003. The work of Betsy Lin Seder deals with the unconscious of architecture, responding to the spectral residue left behind—both in sites and their representations—that informs the experience of place. In this new body of work that continues recent explorations of California mythologies, Seder constructs and places mirrored devices over Julius Shulman photographs. By then re-photographing these images of Case Study and other regional modernist houses, she obscures, reflects, and obliterates his iconic depictions of the International Style set in southern California. Through her precisely planned sculptural interventions, the work becomes a physical manifestation of Seder’s own ambivalent relationship with the images, both as depictions of bourgeois domesticity within the fetishized southern California lifestyle, and as some of the most idealized examples of architectural photography. Within this work, Seder also considers the wider significance and limitations of photography, mining from historically meaningful images, eschewing digital interventions for analogue manipulations, and pushing the literal and figurative boundaries of the photographic frame. Additionally, Seder examines the relationship of photography to woman as author, subject and object. Seder received her BA from Brown University and MFA from UC Irvine. She has had solo shows at Las Cienegas Projects and Workspace in Los Angeles, and has recently shown her work at Headlands Center for the Arts, Saucilito, CA; Torrance Art Museum, The Armory Center for the Arts, Pasadena, CA; The Center for Photography, Woodstock, NY and Nancy Margolis Gallery, NY. She is currently a visiting lecturer at Wellesley College in Massachusetts.